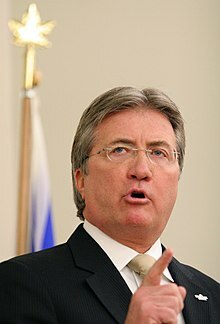 Daniel E. "Danny" Williams, QC (born August 4, 1949) is a Canadian politician, businessman and lawyer who served as the ninth Premier of Newfoundland and Labrador between November 6, 2003, and December 3, 2010. Williams was born and raised in St. John's, Newfoundland and Labrador. Before entering politics Williams was a highly successful lawyer and businessman. After becoming Leader of the Progressive Conservative Party of Newfoundland and Labrador in 2001, he was elected to the House of Assembly in a by-election for the district of Humber West in Corner Brook. Williams' premiership was considered controversial outside of Newfoundland and Labrador. Events such as ordering all Canadian flags to be removed from provincial government buildings, and launching the Anything But Conservative campaign in the 2008 federal election, garnered national attention. While Williams remains a controversial politician outside Newfoundland and Labrador, he was continuously ranked as one of the most popular premiers in Canada, with approval ratings in the province consistently in the high seventies and eighties. Daniel E. Williams was born in St. John's, Newfoundland, Canada, the eldest of four children to Thomas Williams and Teresita (Galway). He received his early education from Saint Bonaventure's College and then Gonzaga High School. The Williams family have been Progressive Conservatives since the province's confederation with Canada; Williams handed out brochures and put up signs in support of John Diefenbaker's campaign to be Prime Minister. Williams went on to study at Memorial University of Newfoundland, where he received a degree in political science and economics. In 1969, he was awarded the Rhodes Scholarship and went to Keble College, Oxford, United Kingdom to read Arts in Law. Whilst at Oxford he played hockey for the Oxford University Ice Hockey Club. He then attended Dalhousie University, Halifax where he earned a Bachelor of Laws degree. While still in law school, Williams led a consortium of businesspeople that was granted one of Newfoundland's first cable television licences and started the company "Avalon Cablevision". Through major acquisitions and the very early adoption of the Internet ISP business (via theZone dial-up and later RoadRunner high-speed cable Internet services), he built Cable Atlantic into one of the largest communications companies in Atlantic Canada. As the principal owner, he sold the telecommunications portion of the business for $76 million in April 2000, to GT Group Telecom Inc. The cable TV portion of Cable Atlantic was sold to Rogers Cable Inc. for $152 million in November 2000. This sale plus the success of his extensive law practice gave him the nickname of "Danny Millions" during the early 2000s. Williams has been practising law since 1972, becoming a financially successful lawyer, and was appointed Queen's Counsel in 1984. His firm represented many of the abused altar boys and orphans who sued the Roman Catholic Church, the Christian Brothers and the province of Newfoundland following the Mount Cashel Orphanage scandal. Williams served as president of OIS Fisher, an oil and natural gas company (later renamed Spectrol Group), and has invested in golf courses and resorts throughout the province. He has also served as the Chairman of the Canadian Parliamentary Channel (CPAC), the Newfoundland and Labrador Film Development Corporation as well as the Provincial Government Offshore Oil Impact Advisory Council. While he was the owner of Cable Atlantic Williams purchased the naming rights to a sports complex in St. John's for $600,000 from Molson. Before the centre opened, however, Williams had sold Cable Atlantic to Rogers Communications to pursue his political career, but retained the naming rights. Ultimately he chose to name the centre Mile One Centre, based on the venue's location at the beginning of the Trans Canada Highway. In 2000, after years of speculation Williams announced his candidacy for the leadership of the Progressive Conservative Party of Newfoundland and Labrador (PC), and was returned uncontested on April 7, 2001. On June 19, 2001, he won a by-election in the Corner Brook district of Humber West. Support for the PC party saw a big bounce when Williams became leader. Four by-elections were held during the two years he was the Opposition Leader and each seat was won by a PC candidate. In September 2001, Liberal Assemblyman (MHA) Ross Wiseman crossed the floor of the House of Assembly to join the Progressive Conservative caucus. During his time as Opposition Leader, Williams donated his legislative salary to charity. Since succeeding Beaton Tulk as Premier of Newfoundland in February 2001, Premier Roger Grimes had been under opposition pressure to legitimize his mandate at the polls after winning the leadership of the Liberal Party (Liberals). On September 29, 2003, Grimes called an election for October 21, 2003. Polls leading up to and during the election showed that the Progressive Conservatives under Williams had a substantial lead over their main competitor the Liberals, as well as the New Democratic Party (NDP). Williams campaigned for change and promised to control spending, streamline the public service and create jobs. The Progressive Conservatives captured nearly 59% of the vote and won 34 of the 48 seats in the 2003 general election. This win marked only the third change of government in the 54 years since the province joined Canada, and ended nearly 15 years of Liberal Party rule. As party leader, Williams became the province's ninth Premier. Soon after being elected, Williams announced the province's debts were so burdensome that he had no choice but to cut spending and freeze wages. Based on the projected $840 million budget deficit for 2004, the government announced sweeping cuts. A number of projects would be cut, and others delayed. Cuts included three health care facilities and a school; delayed projects included, most notably, the opening of The Rooms, the province's cultural facility that was under construction. Spurred by the administration's announcement of pay-freeze and plan to eliminate 4,000 public sector jobs, a strike was declared among the 20,000 public sector employees two days following the announcement, at midnight April 1, 2004. The strike ended nearly a month later when Williams reneged on a campaign promise and legislated the employees back to work. Later that year the Williams government compressed health and education boards in an attempt for a more efficient delivery of services, a move that still receives criticism in the province. An opinion poll conducted in June 2004 showed that support for the Premier and the Progressive Conservatives had plunged. From its nearly 60 percent share of the vote in the general election seven months earlier, support had shrunk to 41 percent, almost tied with the Liberals at 39 percent. His personal support as choice of Premier fell to 39 percent, a marked fall from 65 percent he enjoyed just six months earlier. Williams' popularity increased when he fought with then Canadian Prime Minister Paul Martin over a campaign promise Martin had made that would lead to a revised Atlantic Accord. Martin proposed an eight-year deal that the province would keep 100 percent of offshore oil revenues, but with an expenditure a cap to keep the province from surpassing the per capita tax revenue of Ontario. Williams, supported by the other provincial leaders, walked out of talks with Martin, saying that cap would cost the provincial government billions of dollars in lost revenue over the life of its three oil fields. Williams along with Nova Scotia Premier John Hamm, who also wanted the same deal as Newfoundland and Labrador, met with the Prime Minister on several occasions but a deal between Ottawa and the two provinces could not be reached. Williams raised the temperature on December 23, 2004, when he ordered the removal of all Canadian flags from provincial government buildings. On January 10, 2005, Canadian flags started flying once again in the province, and several weeks later Newfoundland and Labrador and Nova Scotia reached a deal with Ottawa. A March opinion poll indicated that support for the Williams government had rebounded to 86 percent. On March 3, 2006, Williams appeared on Larry King Live where Paul McCartney and then wife Heather Mills argued the seal hunt was inhumane because seal cubs were being clubbed to death. Williams said the annual hunt is supported by scientists, veterinarians and organizations like the UN and the World Wildlife Fund, and that 90% of seals are killed by bullet. Williams accused the McCartneys of being used by IFAW, Greenpeace and PETA to help them raise funds. He then invited the McCartneys to visit Newfoundland and Labrador. On August 21, 2007, Williams signed a Memorandum of understanding for the Hebron offshore oilfield with several major oil companies in which government royalties were exchanged for a 4.9 percent equity stake in the project. On September 17, 2007, Williams called a provincial election. Williams' popularity was riding at 75%, and polls during the campaign showed the Conservatives reaching up to 86 percent of voter support. After the vote count, the Progressive Conservatives emerged with nine more seats than they held at the dissolution of the previous legislature. The party had won 69.5 percent of the popular vote, the highest popular vote share ever attained by the PC party in the province. Three Liberal incumbents, as well as NDP leader Lorraine Michael, successfully held their seats. Notably, however, Liberal leader Gerry Reid was not reelected in his own district. The next month Williams' Progressive Conservatives increased their seat count to 44 out of 48, after winning a deferred election in Grand Falls-Windsor-Buchans following the death of Liberal candidate Gerry Tobin on October 1. On August 20, 2008, Williams and a consortium of oil companies led by Chevron Canada signed a deal to develop the Hebron oil field – the second largest oil field off the coast of the province with an estimated 700 million barrels of oil reserves, worth some $20 billion in royalties and up to 3,500 jobs from the project. Construction is scheduled to start in 2012, with oil extraction by 2017. During the 2008 Canadian Federal election, Williams hit out at incumbent Prime Minister Stephen Harper and the federal administration for reneging on a 2006 election pledge to exclude non-renewable energy sources from the equalization formula. In order to thwart Harper's reelection, Williams launched the "ABC" campaign: Anything But Conservative. The ABC campaign encouraged people to vote for any other party but the Conservatives, with a goal of making sure no Conservative was elected in Newfoundland and Labrador. The campaign, which was supported by all but one member of Williams' caucus, crippled the federal party's ability to find candidates and volunteers. On election night the campaign was successful, the Conservative Party lost the three seats they had held prior to the election, and won only 17% of the popular vote in the province. Despite being shut out of Newfoundland and Labrador the Conservatives did manage to win a second minority government. Following the election Williams announced that it was time to end his battle with Ottawa, and both him and Harper signalled a willingness to work with each other. On June 16, 2009, Williams announced the government had concluded an agreement with oil companies to expand the Hibernia oil field in which the province would have a 10 percent equity stake in the "Hibernia South" extension. The deal promised to add $13 billion to the province's coffers. Williams has been outspoken about the Québec Government and their crown corporation Hydro-Québec. On September 3, 2009, Williams accused Hydro-Québec of trying to block the Lower Churchill hydroelectric project to protect its own dominance in the marketplace by making a deal with New Brunswick Premier Shawn Graham to buy NB Power's nuclear and hydro generating stations, the transmission system and other assets in a massive deal. On October 29, 2009, the premiers of New Brunswick and Québec signed a memorandum of understanding to transfer most assets of NB Power to Hydro-Québec. In the end the deal between New Brunswick and Québec fell apart, Williams dissatisfaction with the deal is thought to have played a role. In a speech given on June 9, 2010, Williams strongly denounced "Québec's self interest is harming the provinces, the nation and our country's international reputation". On November 18, 2010, Williams was joined by Premier of Nova Scotia, Darrell Dexter, in announcing a $6.2 billion agreement to develop the first phase of the Lower Churchill Project. Nalcor Energy, a Newfoundland and Labrador Crown corporation, signed a partnership agreement with Emera Inc. of Nova Scotia to develop the 824 megawatts Muskrat Falls. The hydro development would see power from the falls transferred from Labrador to the island of Newfoundland via an underwater transmission link through the Strait of Belle Isle. Another underwater transmission link across the Gulf of St. Lawrence would bring power to Nova Scotia. Newfoundland and Labrador will use 40 percent of the hydro power itself and will be able to shut down the oil burning Holyrood Thermal Generating Station. Emera Inc. will get 20 percent of the power for $1.2 billion to sell to customers in Nova Scotia. The remaining 40 percent will be sold by Nalcor Energy to markets in Atlantic Canada and the Northeastern United States. Williams' popularity is said to be unmatched in Canadian political history; his high approval ratings lasted right up until his retirement. Although Williams' premiership was considered quite controversial in Canada at large, except for his first year in office, his own provincial approval ratings and those of his government have been consistently in the seventy to eighty percent range for the majority of the time he was in office. According to polling organisation Corporate Research Associates (CRA), Williams remains by far the most popular provincial or federal leader in the country. During his first year in office Williams and his government suffered low approval ratings. However, approval for Williams and his government dramatically improved in 2005. A poll showed support for the Williams government was at 86 percent after Williams secured a deal with Federal Prime Minister Martin over equalization payments. The CRA poll in March 2006 showed 82 percent satisfaction with his government and 71 percent in William's premiership. Polling conducted throughout 2007, showed that support for Williams and his government remained high. In August 2007, the CRA found that 86 percent were satisfied with the government's performance; 77 percent supported Williams as premier, and 76 percent endorsed the PC party. A mid-term poll by CRA in November 2009 showed that 77 percent of decided voters backed Williams' Progressive Conservatives. His popularity had been in the seventies according to polls conducted by the CRA earlier in 2009. Two other polls conducted in late 2009 showed similar results, the first of which was by Global News and Ipsos and the second was by Angus Reid. The Angus Reid poll surveyed Canadians in nine provinces and found that Williams was by far the most popular premier in Canada. 78 percent of respondents in the province approved of Williams' performance, the only other premier to receive the support of more than half of respondents in their province was Saskatchewan Premier Brad Wall with 58 percent. A CRA poll released in March 2010 showed public support for Williams' Progressive Conservative Party that had extended to a record 80 percent of decided voters, up from 77 percent from February. Satisfaction with the government was 93 percent voters. After controversies arose surrounding the accidental expropriation of the Grand Falls-Windsor paper mill and the province's readiness to react to a possible oil spill, the Williams led government as well as his personal popularity took a slight hit. A CRA poll conducted in May 2010, showed that satisfaction with the government was at 87 percent down from 93 percent in March, the party's support had fallen five percent to 75 percent and Williams own support fell to 79 percent down from 81 percent. Even with the slight loss in support Williams remains by far the most popular provincial or federal leader in the country. On November 25, 2010, Williams announced that he would step down as premier on December 3, 2010, and that Deputy Premier Kathy Dunderdale would serve as the premier of the province until a new party leader was elected in 2011. On December 3, 2010, Williams tendered his resignation as Premier and Dunderdale was sworn in as the tenth Premier of Newfoundland and Labrador, becoming the first woman to hold the office. The week following Williams' departure from politics, CRA released a poll conducted during November showing that 90 percent of Newfoundlanders and Labradorians were either completely or mostly satisfied with the performance of the PC government. 75 percent of the respondents supported the Progressive Conservatives, while 76 percent thought Williams was the best choice to be premier. In February 2011, Williams publicly campaigned with Vaughn Granter, who was the PC Candidate in Williams' former district of Humber West. Williams announced in March 2011, that he had decided not to attend a Progressive Conservative tribute dinner in his honour that was set for April 1. The tribute dinner was to be held in conjunction with the leadership convention that would swear Dunderdale in as PC leader. Following this, Williams announced that Premier Dunderdale and her staff were distancing themselves from him. On September 5, 2011, Williams campaigned with Progressive Conservative Association of Alberta leadership candidate Gary Mar in Fort McMurray, Alberta. In October 2015, during the federal election, Williams called Stephen Harper's tactic of making the niqab ban for Muslim women at citizenship ceremonies a national issue borderline racist for how it isolated women and minorities. In May 2011, Williams became a major figure in an effort to bring an American Hockey League (AHL) team back to St. John's. The provincial government rejected a request by St. John's Sports and Entertainment's for a $500,000 annual subsidy, in a move that "shocked" Williams. However, on June 1, Williams announced tentative deals with St. John's Sports and Entertainment and True North Sports & Entertainment, the current owner of the AHL Manitoba Moose. On June 10, a formal announcement was made confirming the deal to move the Manitoba Moose to Mile One Centre. On July 29, Williams held a second event at Mile One Centre where he announced that the team would be named the St. John's IceCaps, and unveiled the team's logo. In December 2011, Williams announced that he was behind a proposal to develop 2400 acres of land in St. John's. The mixed-use development would include residential, commercial and industrial space, the value of the development is estimated at $5 billion over 10 to 20 years. Williams joined Alderon Iron Ore Corp as a Special Advisor to the Executive Chairman in 2012, the company is currently involved in mining exploration in the Labrador Trough. In July 2012, Danny Williams along with Alderon, filed a lawsuit against Sierra Club Canada along with environmental activist Bruno Marcocchio and political blogger Brad Cabana for defamation from comments both on live radio and on Cabana's blog. Williams is the subject of a 2014 National Film Board of Canada documentary film entitled Danny. Co-directed by Justin Simms and William D. MacGillivray, the film premiered in Halifax on September 13, 2014, at the Atlantic Film Festival. The film chronicles Williams' seven years as premier. The high amounts of spending done by Williams's government while he was in power have been blamed for the financial situation that Newfoundland and Labrador has been in since 2015. Premier Dwight Ball claimed that the Williams spending era would be paid down by oil prices of $148/barrel USD  The Lower Churchill Project has doubled in price while oil prices (which make up a significant amount of the province's GDP) have fallen. In June 2016, a poster of Williams's face was put up by anonymous protesters near the Confederation Building alongside posters of Dwight Ball and Cathy Bennett. The poster with William's face on it had the slogan "The Running Mouth". ^ "CBC News In Depth: Danny Williams". Canadian Broadcasting Corporation. October 17, 2006. Retrieved June 13, 2015. ^ "Williams sworn in as Premier". Canadian Broadcasting Corporation. November 6, 2003. Retrieved June 5, 2010. ^ a b c "Newfoundland and Labrador Votes 2007 Leader Profile". Canadian Broadcasting Corporation. Retrieved June 5, 2010. ^ a b c "Humber West by-election" (PDF). Elections Newfoundland and Labrador. Retrieved February 10, 2012. ^ a b "'Anything but Conservative' campaign hurting N.L. Tories: source". Canadian Broadcasting Corporation. September 2, 2008. Retrieved April 29, 2018. ^ a b "Canadian flags ordered down: Williams". Canadian Broadcasting Corporation. December 23, 2004. Retrieved March 13, 2014. ^ a b c d e f "A biography of premier-designate Danny Williams". CTV News. October 21, 2003. Archived from the original on December 3, 2010. Retrieved January 7, 2011. ^ a b c d "Williams' Biography". Progressive Conservative Party of Newfoundland and Labrador. Archived from the original on October 27, 2010. Retrieved January 30, 2011. ^ a b c d e f "Danny Williams, leader of the Progressive Conservative Party". Canadian Broadcasting Corporation. Retrieved January 12, 2011. ^ "Canada online biography". Canadaonline.about.com. August 4, 1950. Archived from the original on June 6, 2011. Retrieved June 5, 2010. ^ a b Don Muret, Venue's Name Game Takes New Twist, Amusement Business, April 9, 2001. Retrieved August 9, 2010. ^ "Danny Williams Interviewed at 1989 PC leadership Election by Deanne Fleet". Canadian Broadcasting Corporation. Retrieved March 8, 2011. ^ "District Profile Trinity North". Canadian Broadcasting Corporation. Retrieved January 30, 2011. ^ "Election three years in the making". Canadian Broadcasting Corporation. Retrieved January 12, 2011. ^ "Newfoundland and Labrador goes blue". Canadian Broadcasting Corporation Archives. November 21, 2003. Retrieved June 13, 2015. ^ a b "Tories sweep to power in Newfoundland and Labrador". Canadian Broadcasting Corporation. October 22, 2003. Retrieved March 13, 2014. ^ "Premier vows public service wage freeze". Canadian Broadcasting Corporation. January 5, 2004. Retrieved March 13, 2014. ^ a b "Budget 2004". Government of Newfoundland and Labrador. Retrieved June 5, 2010. ^ "Nfld. budget cuts projects, 4,000 jobs". Canadian Broadcasting Corporation. March 30, 2004. Retrieved March 13, 2014. ^ "20,000 public workers go on strike". Canadian Broadcasting Corporation. April 1, 2004. Retrieved March 13, 2014. ^ "CUPE, NAPE send strikers back to work – pre-empting legislation". CUPE. April 24, 2004. Retrieved June 13, 2015. ^ a b c "Government plunges in opinion poll". Canadian Broadcasting Corporation. June 2, 2004. Retrieved June 13, 2015. ^ a b "Nfld. premier says PM broke promise". Canadian Broadcasting Corporation. October 26, 2004. Retrieved March 13, 2014. ^ "Williams walks out of first ministers meeting". Canadian Broadcasting Corporation. October 26, 2004. Retrieved March 13, 2014. ^ "No offshore deal, but close: Nfld. premier". Canadian Broadcasting Corporation. November 24, 2004. Retrieved March 13, 2014. ^ "Newfoundland's flag flap 'disrespectful,' PM says". Canadian Broadcasting Corporation. December 24, 2004. Retrieved March 13, 2014. ^ "Maple Leaf flies again in Newfoundland". Canadian Broadcasting Corporation. January 10, 2005. Retrieved June 13, 2015. ^ "Nfld. premier writes PM to solve offshore dispute". Canada: CBC. January 4, 2005. Retrieved March 13, 2014. ^ "Offshore talks about more than money, Williams says". Canadian Broadcasting Corporation. January 31, 2005. Retrieved March 13, 2014. ^ a b "$2.6B deal sends Williams soaring in poll". Canadian Broadcasting Corporation. March 8, 2005. Retrieved March 13, 2014. ^ "Newfoundland premier in CNN showdown with Paul McCartney". Canada: CBC. March 3, 2006. Retrieved April 29, 2018. ^ "N.L. premier takes on ex-Beatle over seal hunt". Canadian Broadcasting Corporation. March 4, 2006. Retrieved March 13, 2014. ^ "Transcript of Interview With Paul McCartney, Heather Mills McCartney". CNN. March 3, 2006. Retrieved June 5, 2010. ^ a b "N.L. announces $16B Hebron oilfield deal". Canadian Broadcasting Corporation. August 22, 2007. Retrieved March 13, 2014. ^ "Writ to drop Monday for N.L. election, Williams confirms". Canadian Broadcasting Corporation. September 14, 2007. Retrieved June 13, 2015. ^ "Massive lead for Tories in N.L. pre-election poll". Canadian Broadcasting Corporation. September 6, 2007. Retrieved March 13, 2014. ^ "Williams leads Tory landslide in N.L". Canadian Broadcasting Corporation. October 9, 2007. Retrieved March 13, 2014. ^ "Liberal Leader Reid loses home district by 7 votes". Canadian Broadcasting Corporation. October 9, 2007. Retrieved March 13, 2014. ^ "Candidate's death shocks Liberal campaign". Canadian Broadcasting Corporation. October 2, 2007. Retrieved March 13, 2014. ^ "Tories take resounding win in deferred N.L. vote". Canadian Broadcasting Corporation. November 6, 2007. Retrieved March 13, 2014. ^ "Williams' Hebron victory: A long time coming". Canadian Broadcasting Corporation. September 20, 2010. Retrieved March 13, 2014. ^ "The Hebron Project". Retrieved June 13, 2015. ^ a b "N.L. expects $20B from Hebron oil deal". Canadian Broadcasting Corporation. August 20, 2008. Retrieved March 13, 2014. ^ "Williams registers anti-Harper 'ABC' campaign with Elections Canada". Canadian Broadcasting Corporation. September 16, 2008. Archived from the original on May 27, 2010. Retrieved June 5, 2010. ^ "Williams escalates fight". National Post. May 4, 2007. Archived from the original on September 12, 2012. Retrieved February 8, 2012. ^ "No appetite for ABC campaign: Marshall". Canadian Broadcasting Corporation. September 8, 2008. Retrieved February 2, 2012. ^ "Goose egg: Conservative vote collapses in N.L." Canadian Broadcasting Corporation. October 15, 2008. Retrieved April 29, 2018. ^ "Williams finished with ABC, ready to take aim at provincial opposition". The Western Star. October 20, 2008. Retrieved February 5, 2012. ^ "Williams and Harper signal they're willing to put feud behind them". The Cape Breton Post. October 15, 2008. Retrieved February 5, 2012. ^ "$10B Hibernia South deal reached: Williams". CBC News. June 26, 2009. Retrieved March 13, 2014. ^ "Province Achieves Increased Equity Stake, Top Royalty Rate in Hibernia Southern Extension". Executive Council Natural Resources. June 16, 2009. Retrieved July 13, 2011. ^ "Williams accuses Hydro-Québec of protectionism". Canadian Broadcasting Corporation. September 3, 2009. Retrieved March 13, 2014. ^ "Why the Quebec, New Brunswick power deal went sour". Financial Post. March 24, 2010. ^ "Canadian Club of Ottawa" (PDF). canadianclubottawa.ca. June 9, 2010. Archived from the original (PDF) on July 6, 2011. Retrieved July 3, 2010. ^ Wallace, Kenyon (February 2, 2010). "N.L. Premier Williams set to have heart surgery in U.S." National Post. Canada. Archived from the original on February 4, 2010. ^ "Newfoundland premier Williams out of ICU, recovering well from heart surgery". Vancouver Sun. Canada. February 8, 2010. Retrieved June 5, 2010. ^ "'My heart, my choice,' Danny Williams says of U.S. surgery". Toronto: The Star. February 22, 2010. Retrieved March 10, 2011. ^ "'My heart, my choice,' Williams says". Canadian Broadcasting Corporation. February 24, 2010. Retrieved March 13, 2014. ^ Bailey, Sue (November 18, 2010). "$6.2B deal reached for Lower Churchill power project". The Toronto Star. Retrieved January 13, 2011. ^ "Historic hydro pact signed between N.L., N.S." Canadian Broadcasting Corporation. November 18, 2010. Retrieved March 13, 2014. ^ "$6.2-billion agreement reached to develop Lower Churchill project in Labrador: Emera". The Telegram. November 18, 2010. Retrieved January 13, 2011. ^ "Lower Churchill Project to Become a Reality; Province Signs Partnership" (PDF). Nalcor Energy. November 18, 2010. Archived from the original (PDF) on June 16, 2015. Retrieved June 13, 2015. ^ a b "Williams' Popularity As A Premier Unmatched In Canadian History". Corporate Research Associates. December 6, 2010. Archived from the original on February 20, 2011. Retrieved January 4, 2011. ^ a b "May 2010 Poll" (PDF). Corporate Research Associates. Retrieved March 6, 2011. ^ "Voter Support for Williams Government Continues to Trend Higher". Corporate Research Associates. March 7, 2006. Retrieved March 10, 2011. ^ "CRA Atlantic Quarterly – Summer 2007" (PDF). Corporate Research Associates. September 5, 2007. Retrieved March 10, 2011. ^ "CRA Poll". Cra.ca. May 30, 2009. Archived from the original on December 23, 2010. Retrieved June 5, 2010. ^ "Videos | Global News". Globalnational.com. Retrieved June 5, 2010. ^ "Williams is Most Popular Canadian Premier". Angus-reid.com. Archived from the original on July 18, 2012. Retrieved June 5, 2010. ^ "Williams, PCs enjoying record support: poll". Canadian Broadcasting Corporation. March 9, 2010. Retrieved March 13, 2014. ^ "N.L. mistakenly expropriated paper mill". CBC News. April 23, 2010. Retrieved March 13, 2014. ^ "Environmentalist doubts N.L. ready for oil spill". CBC News. April 30, 2010. Retrieved March 13, 2014. ^ "Danny Williams retires as N.L. premier". Canadian Broadcasting Corporation. November 25, 2010. Retrieved March 13, 2014. ^ "Dunderdale becomes 1st woman to lead N.L." Canadian Broadcaster Corporation. December 3, 2010. Retrieved April 29, 2018. ^ Smith, Jeremy (February 2011). "Williams enjoying life without politic". The Western Star. Retrieved December 13, 2011. ^ "Shocked that Williams won't attend tribute: premier". Canada: CBC. March 25, 2011. Retrieved April 29, 2018. ^ MacLean, Colin (March 28, 2011). "Williams comments on rift with party". The Telegram. Retrieved December 13, 2011. ^ "Williams to campaign for Mar in Alberta". The Telegram. September 4, 2011. Retrieved September 4, 2011. ^ "Danny Williams says Stephen Harper's tactics are borderline racist". CBC News. October 5, 2015. Retrieved October 5, 2015. ^ "Williams scrambling to bring AHL to St. John's". Canadian Broadcasting Corporation. May 31, 2011. Retrieved April 29, 2018. ^ "Refusal to subsidize AHL shocking: Williams". Canadian Broadcasting Corporation. May 27, 2011. Retrieved April 29, 2018. ^ "Pro hockey returning to St. John's". Canadian Broadcasting Corporation. June 10, 2011. Retrieved April 29, 2018. ^ "IceCaps picked as St. John's AHL team name". Canadian Broadcasting Corporation. July 31, 2011. Retrieved April 29, 2018. ^ "Danny Williams backs $5B land plan in St. John's". Canadian Broadcasting Corporation. December 13, 2011. Retrieved April 29, 2018. ^ "Danny Williams named mining company advisor". Canadian Broadcasting Corporation. January 5, 2012. Retrieved April 29, 2018. ^ "Danny Williams and mining company sue environmentalists, blogger". CBC News. July 11, 2012. Retrieved August 20, 2012. ^ "Documentary about former premier Danny Williams to premiere at film festival". The Telegram. August 6, 2014. Retrieved September 15, 2014. ^ McGregor, P. (September 12, 2014). "Danny Williams documentary premieres at Atlantic Film Festival". CBC News. Retrieved September 15, 2014. ^ "October 9, 2007 Provincial General Election Report" (PDF). Elections Newfoundland and Labrador. Retrieved June 13, 2015. ^ "Report on the October 21, 2003 General Election" (PDF). Elections Newfoundland and Labrador. Retrieved June 13, 2015. Wikimedia Commons has media related to Danny Williams.